For Sikhs the history of Visakhi traces its origin from the Baisakhi Day celebrations of 1699 organized by the Tenth Sikh Guru, Guru Gobind Singh to form the Khalsa - Brotherhood of Saint Soldiers to fight against tyranny and oppression. The events after the sacrifice of Sri Guru Teg Bahadur Ji, his son, Guru Gobind Singh became the next Guru of the Sikhs. Sri Guru Gobind Singh Ji wished to instil courage and strength to sacrifice among his fellow men. To fulfil his dream, He called on the historic Baisakhi Day a congregation of Sikhs at Keshgarh Sahib near Anandpur on March 30, 1699. 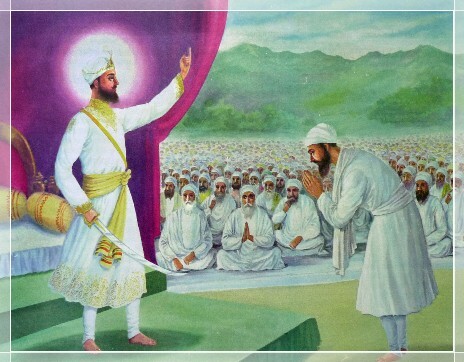 On this day Guru Gobind Singh Ji knighted the 'Panj Pyare'. The Five beloved ones were Daya Ram, a Khatri, Daram Das, a Jat, Mohkam Chand, a chhimba, Himmat, a cook and Sahib Chand, a barber. With the creation of Khalsa, Baisakhi was enshrined in Sikh history. "On the day Guru Gobind Singh Ji prepared Amrit in Anandpur, the attendance in the Diwan was about 50 to 70 thousands. The Mughals had four thrones (seats of Imperial Power), Delhi, Agra, Lahore and Kalanur, but the grandeur of Guru Ji's throne was in a class by itself. The grandeur of this throne was out of this world. Guru Ji came to the Diwan and, unsheathing his sword, spoke in his thundering voice that he needed a head. No questions or hesitation at all, Bhai Dya Ram came forward to Guru Ji. Guru Ji right in front of all, cut off his head from the body in one stroke. Every body present was stunned. Then Guru Ji again thundered and demanded one more head. Right on Guru's call, Dharam Chand got up, came to Guru Ji, bowed his head and said here is my offering of my head. Guru Ji, again, in one stroke cut off Dharam Chand's head from his body. Now there was a big commotion in the Diwan. But Guru Ji in his thundering voice went on demanding heads, one after the other. Himmat Rai, Mohkam Chand and Sahib Ram got up and offered their heads. Guru Ji cut off the heads of these three also. Many from the congregation went to Guru Ji's mother, and narrated the whole happenings in the Diwan to Mata Ji. Guru Ji cleaned up the blood from the five bodies and heads, and even washed the floor, Then the Guru of these infidels, stitched one head with other body, one by one. This process took about three hours. Then he covered these dead bodies with white sheets. The Guru of the infidels then took a cauldron made of stone and put an iron wok without handles on top of it. Poured water into the wok and started preparing the "Amrit" (Aab-e-hyat - Elixir of life). The infidel Guru kept churning the water with his sword and kept on reciting his Kalma (Gurbani). This process went on for 1.5 to 2 hours. During this time, a lady from Guru's house came and put something in that water. Now the Amrit "Elixir" was ready. From the corpses, he took the covering sheets off. First he sat on the head side of Dya Ram, and poured AMRIT "Elixir" in his mouth, then poured some on his head and sprinkled some on his body, and then he asked the dead body to say "Waheguru Ji Ka Khalsa, Waheguru Ji Ki Fateh." As if on his Guru's Command, Dya Ram got up and repeated in his bold voice,"Waheguru Ji Ka Khalsa, Waheguru Ji Ki Fateh." It appeared that in the entire congregation every body was so stunned and as if stopped breathing. There was pin-drop silence. All those present were mesmerized with their Guru's miracle. In the same manner, one after the other, Guru made the other four alive too. Then, he took all five of them inside a tent. After a while Guru Ji along with the five came out. The Five were now wearing new attire. Those five risen from the dead were standing in a line. Then Guru came in front of them and took the "Bir Asan" (Posture of the brave - kneeling on one knee) and asked for the Amrit "Elixir." At this point, these five asked, what are you offering to get this Amrit "Elixir." Then Guru said that I would sacrifice my parents and my sons for your sake. Then these five gave Amrit "Elixir" to Guru Ji, and his name was changed to "Gobind Singh." The word "Singh" was attached with other five's too - Dya Singh, Dharam Singh, Himmat Singh, Mohkam Singh and Sahib Singh. I was very remorseful and cried like a baby. After that, thousands took the AMRIT "Elixir". Even, I was attracted by a magnetic force and with utmost regret fell on Guru's feet. I requested Guru to give me Amrit (Aaab-e-hyat) too. Guru Ji already knew about my role as a spy and a traitor, put his hand on my back, gave me Amrit and changed my name to Ajmer Singh. Just with this act, my sins of numerous lives got washed away. I participated in many wars. On that day, I sent my last report to Emperor Aurang Zeb. In this report I wrote my eyewitness account in details. I also warned Aurang Zeb in the strongest possible words not to dare challenge the incarnation of God, and desist from cruel policies and that if he did not listen to and act on my advise, then God forbid, he would lose all - his throne and family." (Extracted from the unpublished text of "History of Ramgarhias"). Gyani Dalip Singh "Komal" of Dhaunola informed that this book is lying in the archives of Aligarh University. Sant Khalsa means a Singh, a Saint, who is pure in words, thoughts, deeds and has been blessed with Gurumantar by the Guru. They were to follow the strict code of conduct as laid down by Satguru Gobind Singh Jj based on harmonious blending of the spirit of life with that of the moral fervour and physical courage. Satguru Ram Singh Ji laid the foundation stone of the new socio-religious order called the Sant Khalsa. This was modeled on the pattern of Khalsa conceived by Satguru Gobind Singh Ji. Every Sikh was required to be baptised with Amrit (the sacred nectar), and blessed with Gurmantar in his ears. After 158 years of Satguru Gobind Singh Ji's establishment of Khalsa Panth, Satguru Ram Singh Ji prepared the Amrit on the Baisakhi day, i.e., 12th of April, 1857, and founded the Namdhari Sect. The following five persons were the firsts to be blessed with Guru Mantar and baptized with Amrit. They became the 'Namdhari Sikhs' - The Sant Sipahi's - the Sant Khalsa. Sant Kahan Singh Nihang: He belonged to the village Chak Kalan, of Malerkotla. He was Subedar in the Sikh regiment along with Satguru Ram Singh Ji. He had become a true devotee of Satguru Ram Singh Ji, while he was still in the army. After the battle of Mudaki, he left the army and came to Sri Bhaini Sahib. Sant Labh Singh: He vas a famous ragi (musician) from Amritsar. One day he heard the heavenly voice, while sleeping, "if you want to have darshan of the Guru, come to Bhaini sahib". He woke up from sleep and irnmediarely left for Sri Bhaini Sahib. Sant Atma Singh: He was a learned person from district Sialkot. He went in search of me true Guru to Sri Bhaini Sahib, where all his desires were fulfilled. Sant Naina Singh: He was from the village Wariyah district Amritsar. He had a keen desire to receive blessings from the Guru. Sant Labh Singh guided him to go to Sri Bhaini Sahib and have the blessings of the Guru. Sant Sudh Singh: He was from the village Durgapur district Jallandhar. They were then called Sant Khalsa or Namdhari Sikhs.